This is one of the most popular palms in the world because of its easy maintenance characteristics. This one possesses a legendary ability to put up with low light, drought and general abuse in most environments. Additionally it flowers when still quite young. It has been in use since Victorian times. 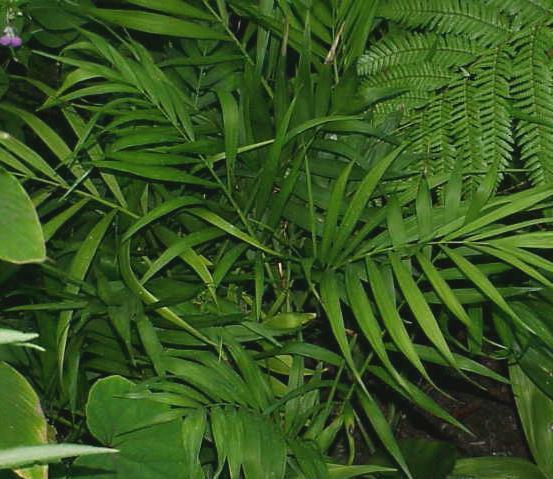 This palm usually never exceeds 12 feet tall therefore it is recommended for use as a house plant or conservatory specimen. This is also known as a common house plant which is even available at discount garden centers. The plants are slow growing and can be maintained in a pot that can be brought indoors in the winter months. The plant eventually can be permanantly relocated outdoors with overhead protection.